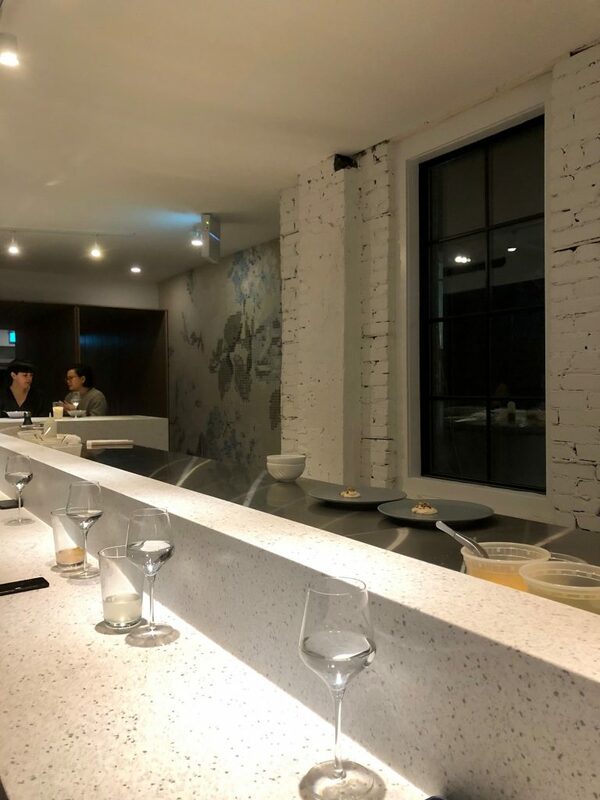 When I first heard about Ten, an entirely new restaurant concept where ten diners experience a ten-course tasting menu at a kitchen counter, it piqued my epicurean senses. 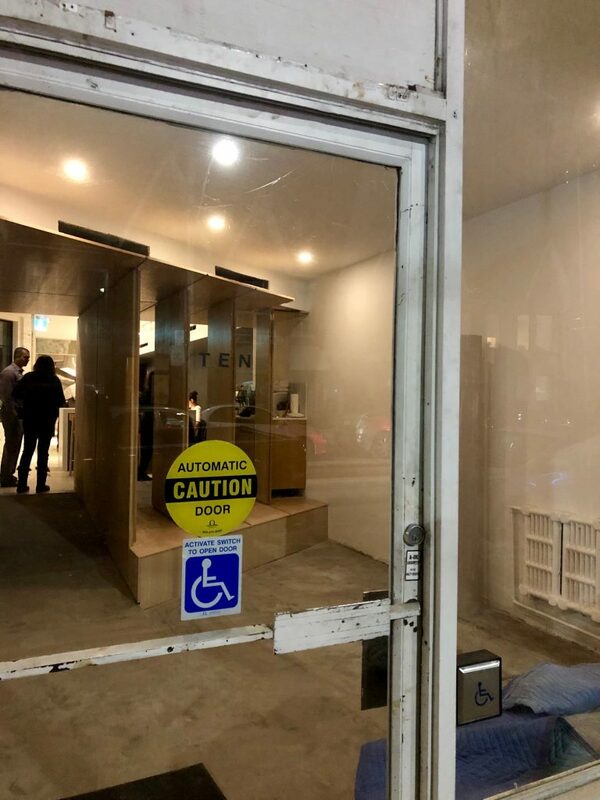 After some brief Googling, I learned that the young man behind the concept was 25-year-old Julian Bentivegna, an up-and-coming chef who gained experience in some high-end kitchens — including Alo and the former three Michelin starred Grace Restaurant in Chicago (now closed). Ten is Bentivegna’s foray into restaurant ownership, and, according to the website, it aims to highlight seasonal ingredients and push Canadian fine dining forward. It’s located at 1132 College Street in Toronto’s Brockton Village neighbourhood. 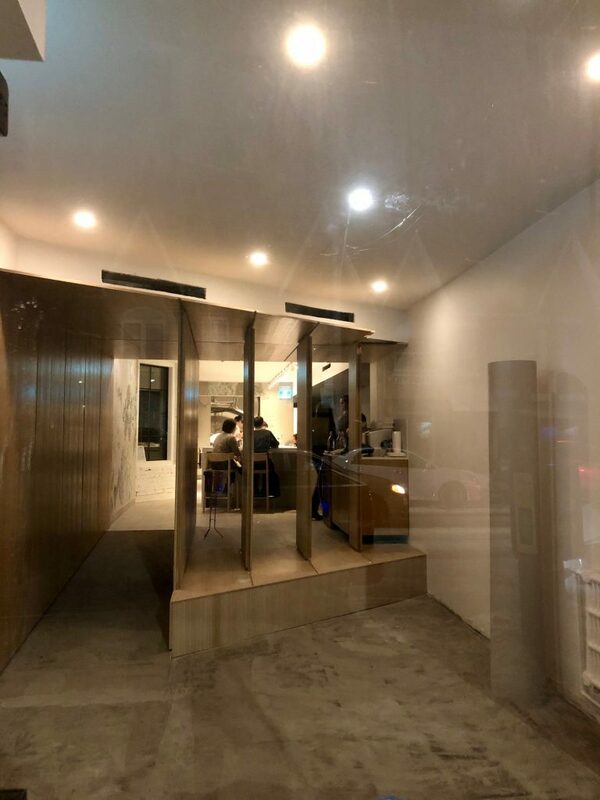 Back in January, when Ten announced its opening, I made a Saturday reservation through Tock, an online platform that many Michelin star and high-end establishments use. At the time of booking, I paid in full for two ten-course meals (at $115 each minus beverages, tax and gratuities), noted my food sensitivities, and marked it dans mon calendrier. After much anticipation, the night finally arrived. Walking up to the door, Ten’s sterile appearance was un petit peu eerie. The front area, which was a still yet-to-launch bar area, was devoid of any furnishings. We were greeted by a flustered manager, who hastily took our coats and escorted us to our seats — front-row, just as we’d ordered. Eight other straight-faced patrons sat in a reverse L-shape around the narrow kitchen counter. The quiet music drowned out the even quieter conversation. Something was up. Jenn Hunter, the sommelier, greeted us and broke the bad news: they were still waiting for their liquor license. “Didn’t you get the email we sent?” she said, desperate for some form of acknowledgement. I replied with a puzzled expression. In lieu of wine tastings and fruity cocktails, she was offering artisan mocktails or San Pellegrino. I eyed the row of clear wine glasses which begged to be filled with a majestic Burgundy. At least the food could redeem itself…or so I thought. I observed Bentivegna’s lanky frame, moving awkwardly through the organized kitchen — mise en place ingredients were displayed in clear containers (some came from Bulk Barn). 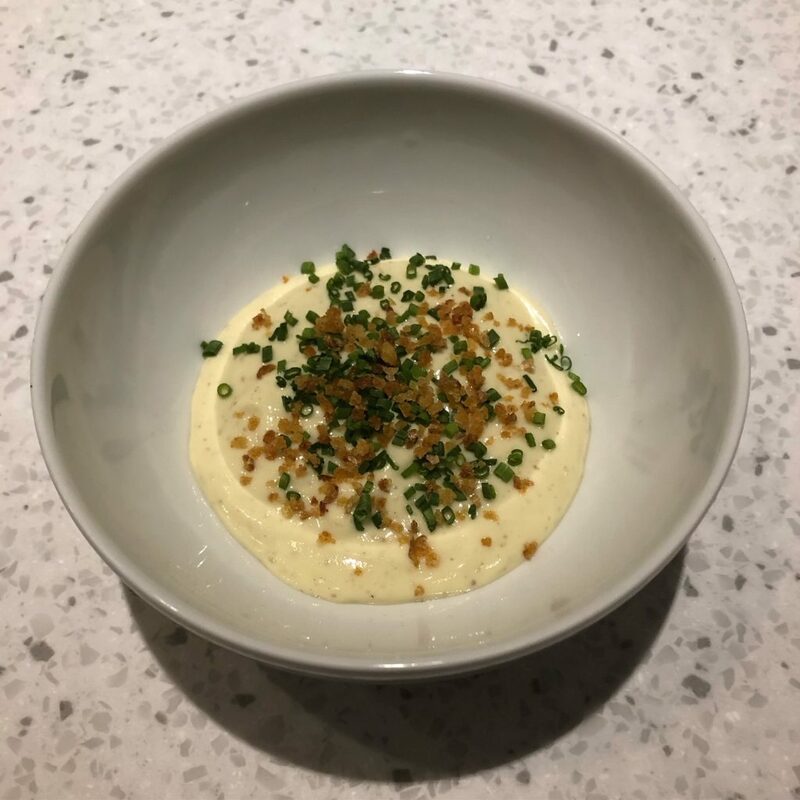 The sous chef reached into a container and plopped a pale yellow gelatinous mixture — soft set potato custard — into a bowl and topped it with chives and potato crumbs. One bite of the bland mixture was enough. Was this Bentivegna’s idea of making a memorable first impression? My perplexed mood turned sour when I asked the sous chef where the washroom was, and she didn’t know. Artistry in presentation improved on the second course. A rustic chunk of parsnip had been dehydrated, then fried. It was served on top of celery root purée with segments of orange and fried scallion. Instead of being chip-like in texture, the lifeless vegetable had a half-cooked interior and a dry exterior, contributing to an overall chewy texture. 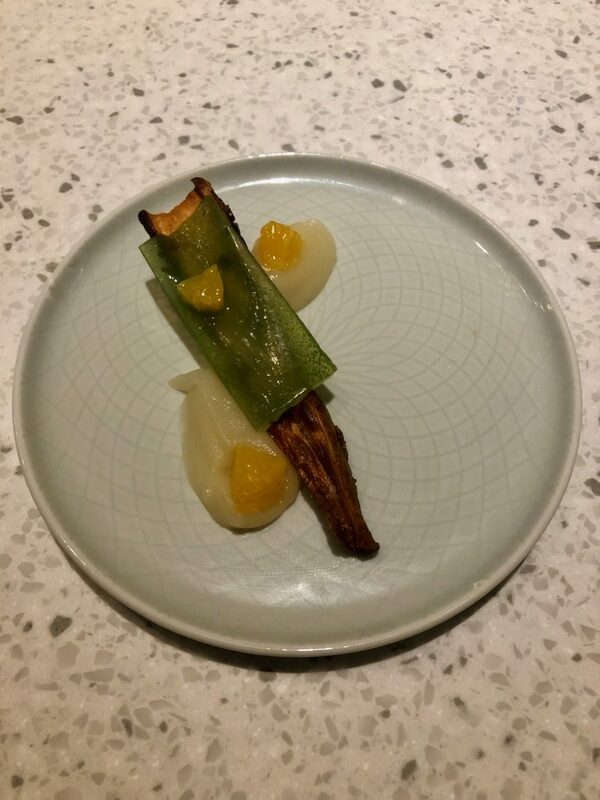 Although it was tough to cut through, the celery puree and orange were a palatable combination, and helped detract from the poorly cooked vegetable. Third course was trending in la bonne direction. 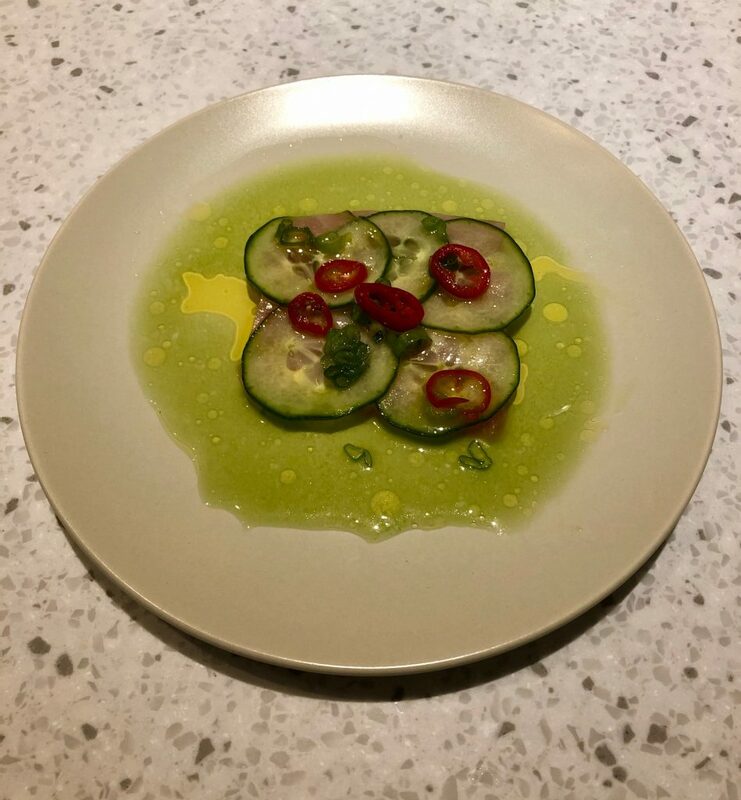 Four thin slices of Kampachi, sourced from Hawaii, were doused with cucumber broth and lime juice — bringing the right level of acidity to the dish. 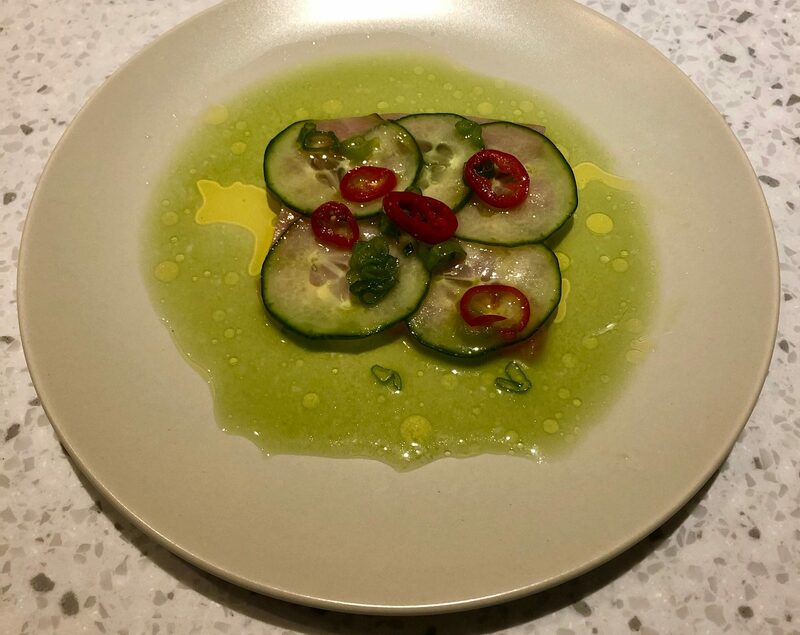 Mandolined, pickled cucumbers blanketed the fish, which was then sprinkled with chili peppers and scallion. 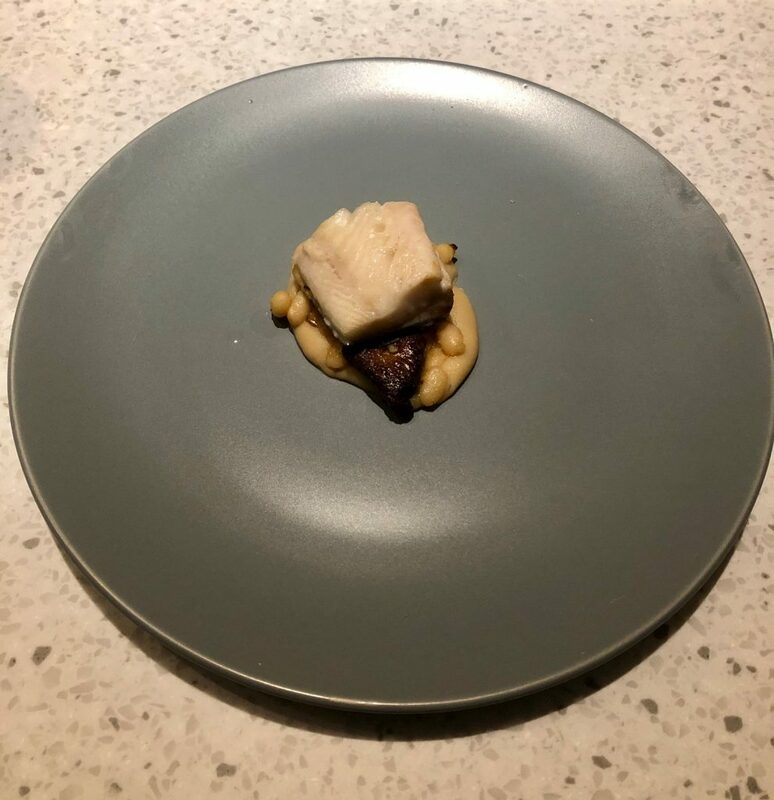 While there was room for improvement in the knife skills department, the fish was fresh and overall presentation struck a balance between élégant and self-assured. Butter-basted roasted pumpkin arrived next. 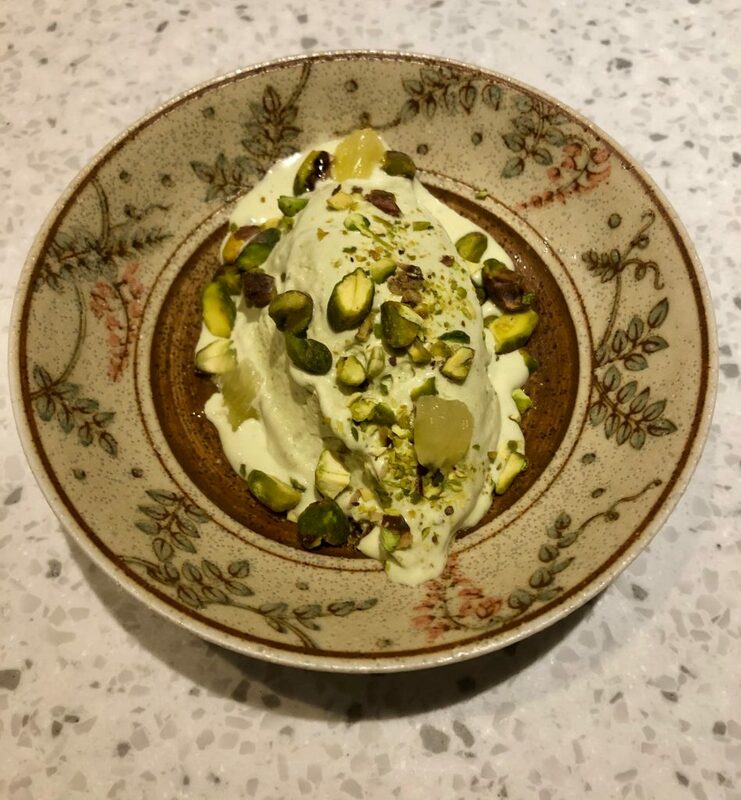 It was rich in flavour and the accompanying cashew cream elevated its natural flavours along with the sprinkling of sunflower seeds and a splash of rosemary oil. Sometimes simplicity works, and in this dish, it certainly did. I was, however, hoping for something a little more inventive — something I couldn’t make chez moi. Butter basted pumpkin (with fingerprints still on the plate). Before the next course arrived, Bentivegna implied that I could try a bit of gluten, even though I marked it as a sensitivity. 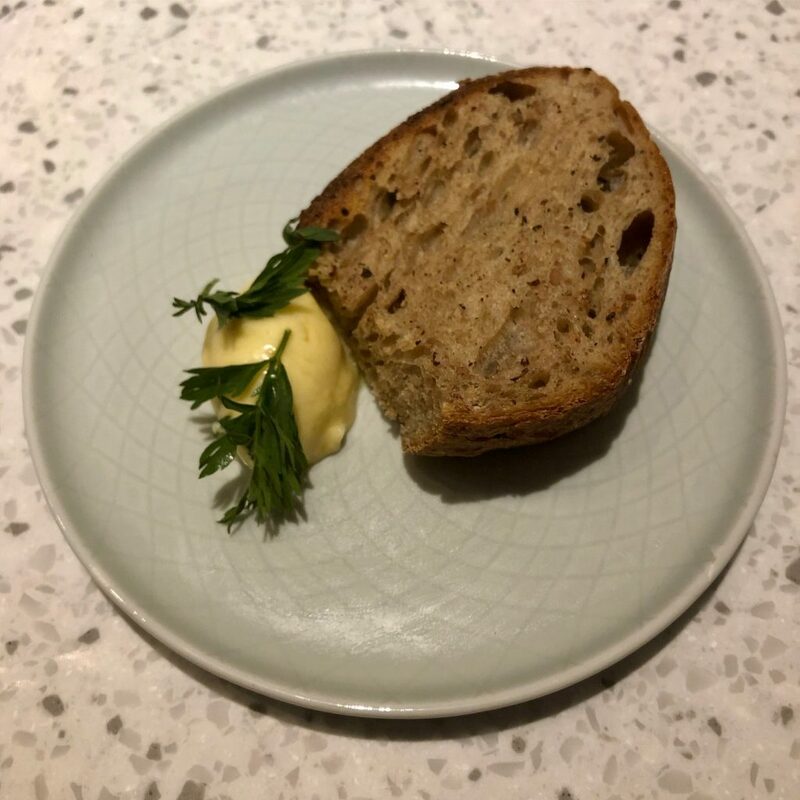 A hearty slice of rye sourdough was paired with carrot butter, giving it an earthy sweetness. 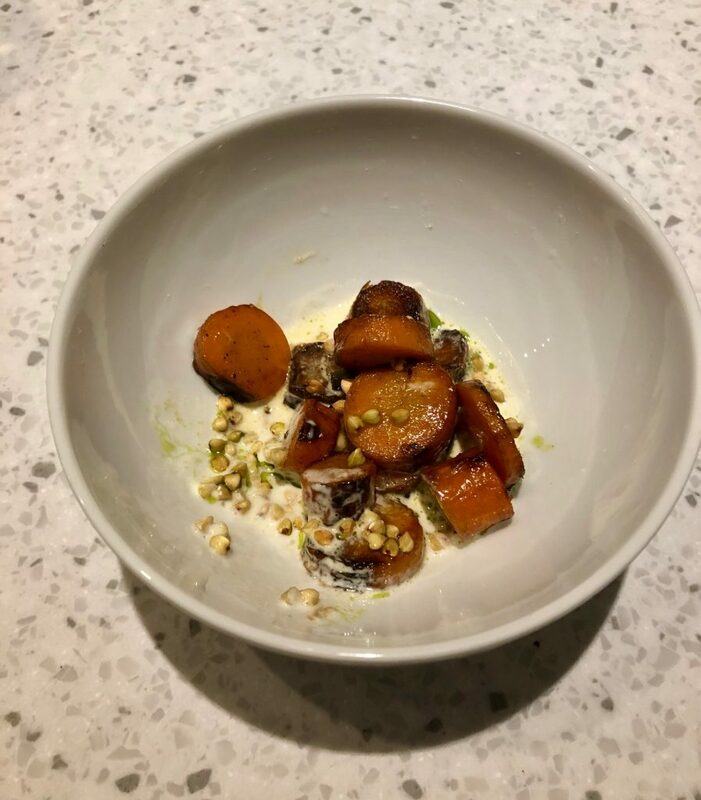 The carrot theme continued with the next course: roasted carrots in a ginger chamomile base with carrot butter, toasted buckwheat and rosemary oil. By this point, I had seen enough carrot and rosemary oil from previous dishes. The ginger chamomile base was porridge-like in texture but provided some flavourful dimensions that were sorely lacking in earlier courses. Roasted carrots with ginger, chamomile and toasted buckwheat. Absorbing all the sights and sounds between courses, I witnessed an obvious cacophoniebetween front of house and back of house. They failed to work in unison. No one cracked a smile. And the tension? I could have cut it with one of Bentivegna’s knives. 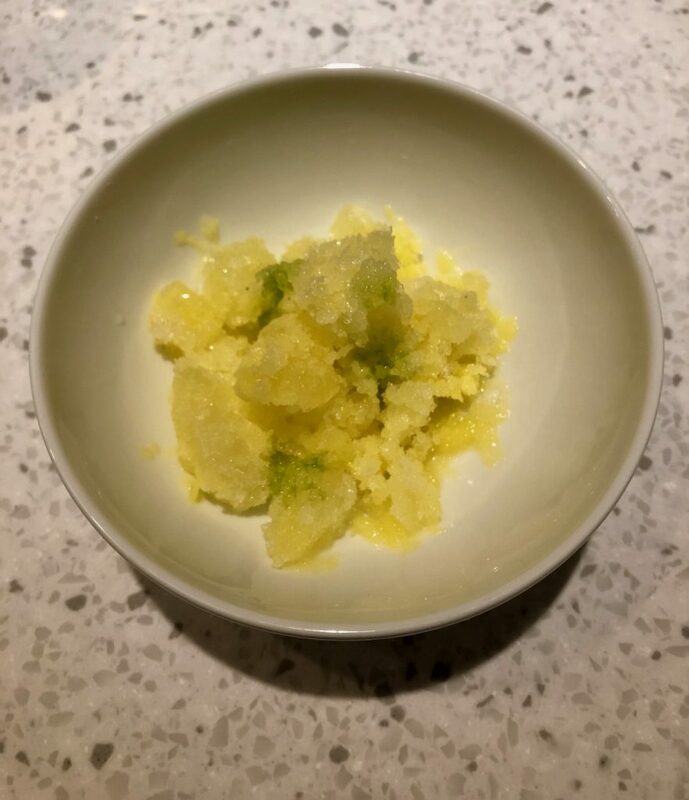 A generous portion of pineapple ice with rosemary oil appeared shortly after, which was meant to reset the taste buds. The tropical notes from the fruit played well with the herby oil, which got a lot of mileage throughout the menu. There’s always hope as the dessert course approaches, as some chefs are more skilled in this area. Out of two desserts, the basil ice cream with toasted pistachios and lemon was a standout. I sang its praises to my date. “Oh yea, that’s always a crowd pleaser,” Bentivegna interjected. While the taste was on point, the texture missed the mark. 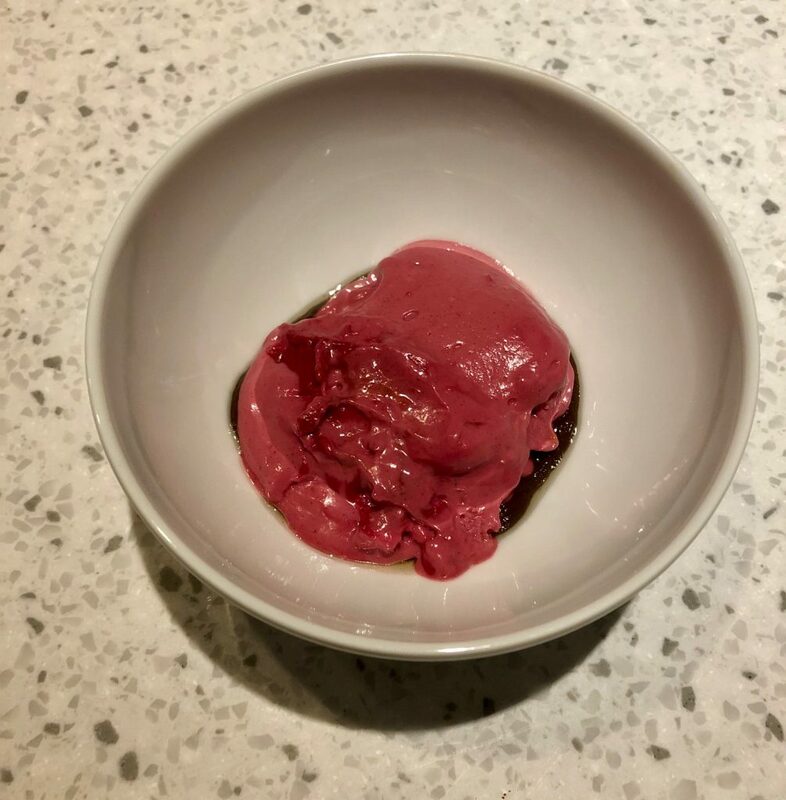 Instead of a perfectly frozen quenelle, it was a sloppy puddle (albeit a deliciously creamy one). The last course was a risky play on lemon meringue pie. The dominant citrus flavor had been swapped out for earthy beets. Much like the first course, it resembled a pudding, with a surprising chocolaty crust buried at the bottom. Unfortunately, the pudding-like texture fell through the fork it was served with. A spoon would have been the preferred utensil. I recalled scrolling through Instagram days earlier and seeing a beet pie. I can only assume this was a flop of the same dessert. C’est dommage. On a more positive note, the ambiance was delightful. A monochromatic colour palette contributed to a clean and contemporary feel. Mon élément préféré was a large mosaic wall, displaying a blue floral motif. Be warned: don’t let a refined interior disguise the sloppy cooking. For a ten-course menu priced at $115 a person, I’d want to know what I’m investing in before putting down a non-refundable deposit. As an amateur restaurateur, Bentivegna would benefit from a more experienced partner to show him the ropes — including an overhaul of the menu and a lesson in attention to detail (i.e. no Bulk Barn containers, hang the mirror in your washroom prior to opening, plate with care because everyone is watching). 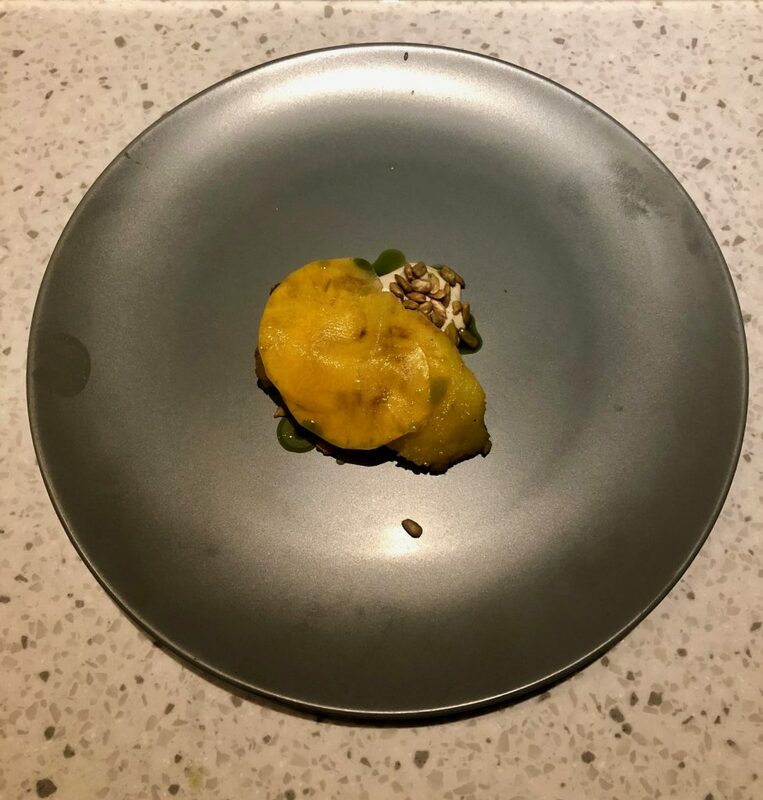 Regrettably, Bentivegna’s inaugural fine dining restaurant has left a bitter taste dans ma bouche. I felt like I was promised an elaborate dining experience, which later unraveled right before my eyes. If you’ve seen the popular Netflix documentary, Fyre, you’ll know exactly how I felt. Ten’s tasting menu proved that Bentivegna, while talented, is still very much a neophyte rather than an expert.